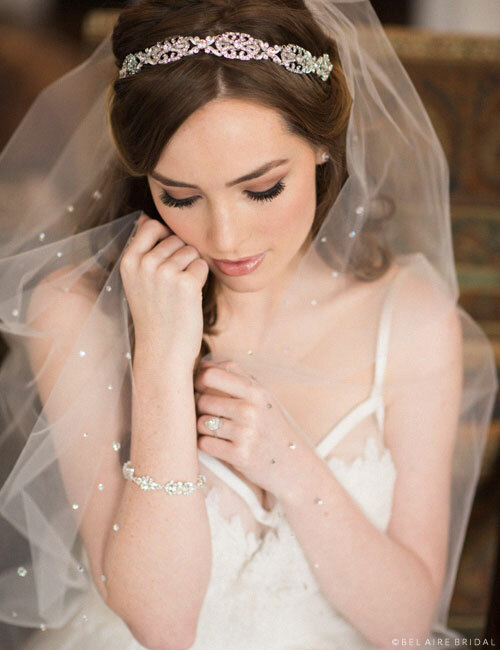 Leave a lasting impression wearing a beautiful vintage-inspired headpiece. Sparkling with silver filigree and opulent rhinestones, this gorgeous tie headband adds timeless allure to your look. Pair it with the rhinestone jewelry of your choice for a glamorous ensemble. Available in silver. Shown with 1-tier fingertip cascading folded ribbon veil (V7303) and rhinestone earrings (EA250).